Breakfast, lunch (at the Guesthouse or as a pick-nick basket) and dinner. Price per person: 8 350 SEK. Price per person: 4 290 SEK. No matter what your needs are we will do our outmost to fulfil them, send us an email with your wishes and we will get back to you with an offer. 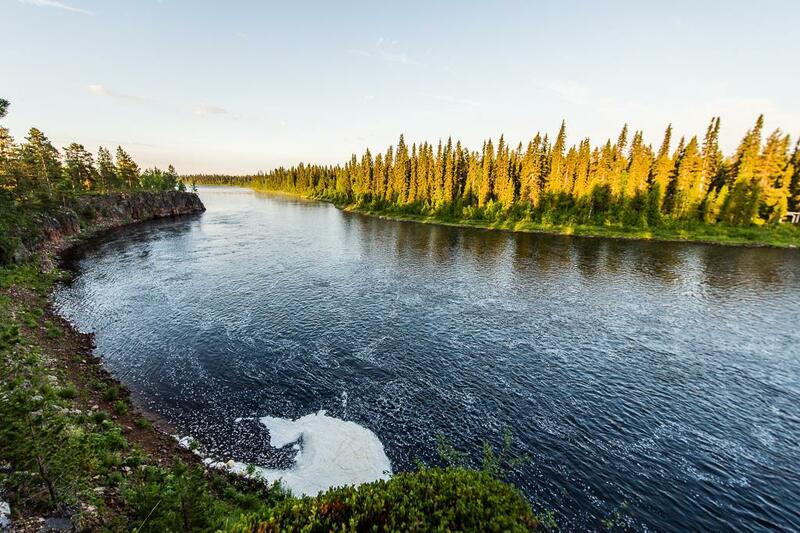 Lapland Guesthouse is situated right by the river bank, where you can see the Salmon leaping out of the air, from the bedroom windows. The buildings are timber cabins and lodges, and here you’ll experience the true atmosphere of Kangos and Swedish Lapland. All of our rooms are different and they all have character. After a long day fishing you can come home to the lodge and eat a warm meal, made from local ingredients and with a lot of heart and to finish off, why not jump into the hot tub or our traditional sauna, where you can enjoy a cold beer. The fishing in the Lainio River right by the Lodge, is on the Kangos Association waters, where we offer fishing on 32 kilometres, both sides of the river. And don’t forget to sneak down to the Stenevads Home Pool after your buddies have had one too many. Explore the vast and majestic flowing waters of the Lainio river across 30km of the Kangos region. 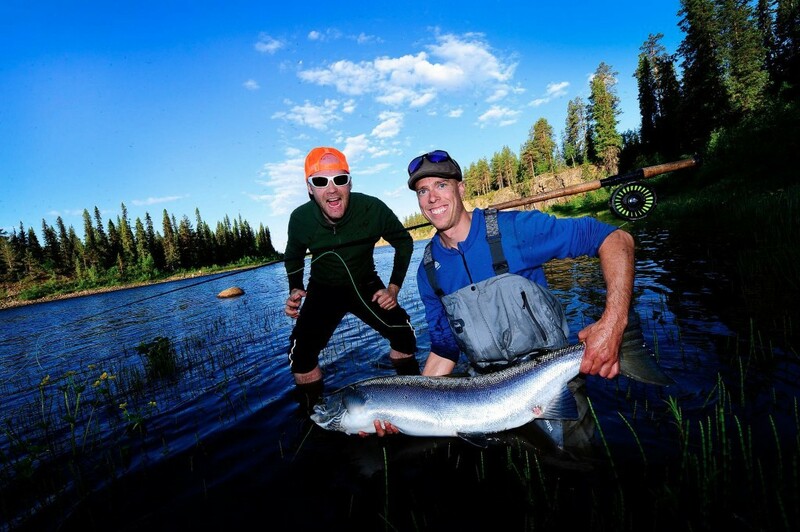 Guests will have the opportunity to fish double bank in some of the most remote salmon fishing locations in the world. 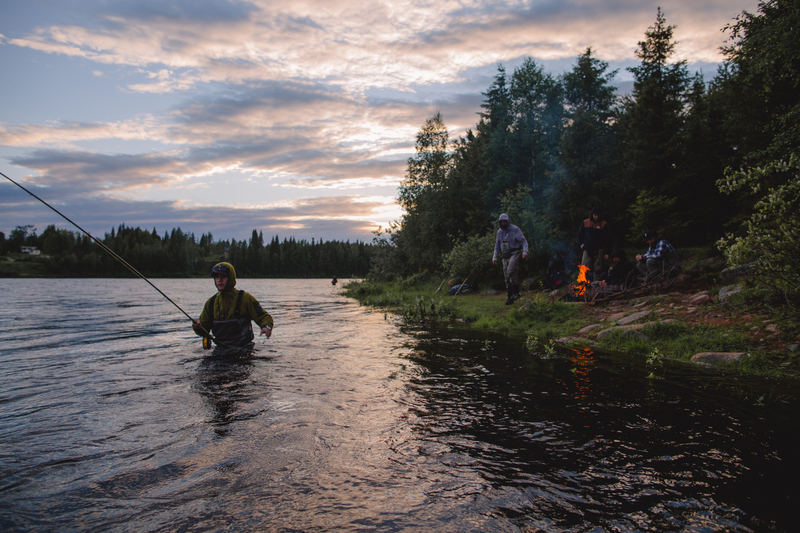 Whether off-road or hiking through dense forestry to discover perfect pools on foot or by drift boat, our guests will undoubtedly get to fish pools that have not been fished on the same day. They may not have been fished that week, month or even year! The Lainio is one of the last untouched wilderness rivers for Baltic salmon fishing and access can be tricky at the best of times. With our driven tours guided or hosted by our fantastic and well experienced fly fishing team, our Lainio Safari tours will provide unforgettable salmon fishing experiences like no other. The Lainio river is a tributary to the Torne river system with as much as 60% of the salmon running the system each year. Our average size is an impressive 15lbs and every year we land numerous fish north of 20lbs, with some lucky anglers reaching the 30lbs and even 40lbs mark. 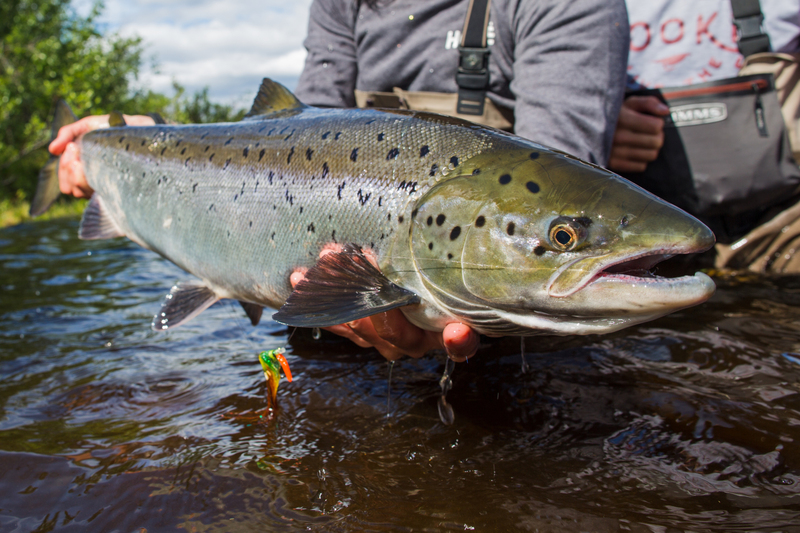 It is no secret that the Torne river system fish are some of the largest in the world and with fish recorded to 150cm+ each year, perhaps someone will be lucky enough to land a fabled 50lbs+ salmon in the seasons to come. We all dream of that day. 90% of the time we fish with versi-tip lines with a floating belly and different types of sink tips. Simply because you can quickly change the tips, while standing in the water. If you don’t have a versi-tip line make sure that you at least have a floating, sink 2 and sink 4 with you. But remember, one can’t have too many lines. 10-20 feet tapered leaders with a tippet between 0,25mm. and 0,50 mm. Colder waters expect leaders as short as 4 feet. Tippet spools from 0,25 mm. – 0,50 mm. Mosquito spray or roll on repellent such as “Jungle Oil” is strongly advised. A wading staff is always good to have on hand and a camera for the special moments! Salmon-fishing is allowed between June 1st and August 31st. Limited catch of 1 salmon per day. All female salmon must be released during the month of August. Minimum kill size is 50 centimetres. Salmon hooked during the prohibited period or after one salmon is already caught must be returned into the water, dead or alive! During the month of August all female salmon must be returned into the water, dead or alive! All types of fishing with live bait, is NOT allowed. All types of spin fishing with added lead weights is NOT allowed. All methods of faul hook fishing, is NOT allowed. Anyone caught practicing these methods will be prosecuted, blacklisted and banned for further fishing! Maximum 3 grayling per day per person. Minimum kill size is 35 centimetres. It is very important to have complete statistics of captured and released fish. Therefore, you are obligated to report your catch within 24 hours after you have stopped fishing. This is compulsory for the whole season. Fraudulent reports will result in an instant suspension! You will receive a catch report by SMS, that has to be filled in, even if nothing was caught. Support the fish under the belly and steady carefully by the tail. Make sure that the fish can “stand” by itself facing upstream before letting it go. Never rock the fish back and forth, this only forces unwanted water into the airwaves. Proper care in releasing a fish can make all the difference to it’s survival, the amount of time taken releasing a fish following these procedures does not matter, better to take your time and allow the fish to fully recover. A strong kick, a splash in the face and a drop of your hat saluting a beautiful creature as it heads back into the river and everyone has a fantastic day! For everyone’s well-being, respect each other and the restrictions. One step downstream between each cast, do NOT occupy a pool, without leaving room for other fishermen! Do not keep more fish than you need, cooperate with the supervisor and help us to fight illegal fishing! Keep Sweden clean pick up your trash! Remember! People caught breaking the rules will receive a ban for the rest of the season and may lead to a permanent suspension! The fishing season starts the 1st of June and ends the 31st of August at midnight. The rest of the year, no fishing is allowed! The only boats allowed on the river, is boats owned by locals. They are all marked with individual numbers and Lapland Guesthouse has boats for rent. Lapland Guesthouse, open for pre-bookings. Pine Tree Lodge, open every day. Summer café, at Lapland Guesthouse. Brown Bear Bar, at Pine Tree Lodge. ICA Holmas in central Kangos, open Monday – Saturday. At ICA Holmas, a gas pump where you pay with VISA or Master Card. Rental cars can be booked and hired at all airports.